#FrozenFour Semi-Final Tale of the Tape for Thursday's Matches! #FrozenFour Semi-Final Tale of the Tape for Thursday&apos;s Matches! Hey Tampa! 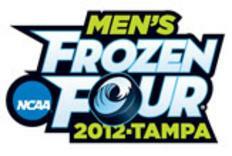 The Frozen Four is finally here, welcome to college hockey’s biggest stage! Kristin here to give you a preview of the semi- final games that will be taking place on April 5th right in our backyard at the Tampa Bay Times Forum. The four teams that punched their tickets to Tampa are Ferris State University of Big Rapids Michigan, Union College of Schenectady New York, Boston College, and the University of Minnesota. Ferris State will be taking on Union College on Thursday April 5th at 4:30 pm ET. The game will be broadcasted on ESPNU. Ferris State took out Denver 2-1, and Cornell 2-1 to reach the semi- final game, as Union defeated Michigan State3-1, and University of Massachusetts Lowell 4-2. Both schools have never gone this far, making the match up a Cinderella story for the survivor. The second game of the semi- finals will be April 5th at 8: 00 pm ET. with the meeting of two powerhouse programs, top seeded Boston College, and the Minnesota Golden Gophers. Boston College was the national champion in 2010, returning to take the crown. They defeated Air Force 4-0, and Minnesota Duluth 4-0 in the quarterfinals. Minnesota knocked out Boston University 7-3, and North Dakota 5-2. The game will be broadcasted live on ESPN2. Stay posted for more Tampa Bay sports updates on the final game which will take place April 7.